Advanced nurses develop health interventions and evaluate healthcare outcomes for individuals and families. 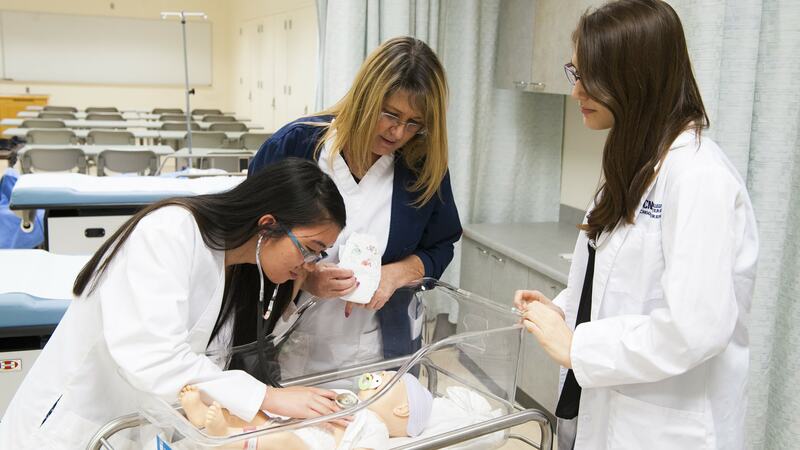 TCNJ offers a Master of Science in Nursing (MSN) with four NP options: Family Nurse Practitioner, Adult Nurse Practitioner, Neonatal Nurse Practitioner, and a variation in the Family Nurse Practitioner option for BSN-prepared nurse midwives and nurse practitioners. A bridge program to the MSN for RNs with a non-nursing baccalaureate and Post-MSN Certifications are also available. This fully accredited program builds on the nursing and scientific knowledge base of the baccalaureate-prepared nurse and focuses on advanced clinical decision-making and critical thinking skills. Graduates are prepared to accurately and critically assess the health and illness experiences of school age children. Faculty advisors work closely with each student to plan an appropriate course of study and to ensure progress through the program. RN’s with a BSN who wish to enter advanced practice as nurse practitioners may complete this MSN program in two academic years of full-time study plus two summers. Students choosing to attend classes on a part-time basis must complete the MSN within six years of being accepted into the program. This Family Nurse Practitioner (FNP) option is for BSN-prepared nurse midwives and nurse practitioners. Students choosing to attend classes on a part-time basis must complete the MSN within six years of being accepted into the program. RN’s with a BSN who wish to enter advanced practice as nurse practitioners may complete this MSN program in two academic years of full-time study plus two summers. Students complete 23 credits at TCNJ and 15 at Thomas Jefferson University. Students choosing to attend classes on a part-time basis must complete the MSN within six years of being accepted into the program. We currently do not offer distance learning options. The School of Nursing at The College of New Jersey places great emphasis on its role in developing a community of nursing professionals through intensive mentoring and fostering of collegial relationships. We have found that the interactions necessary to achieve these goals occur best in an interactive classroom setting. All lecture and seminar classes are held on TCNJ’s campus, except for the Neonatal NP specialty courses. The NNP program is a consortium based program and NNP specialty courses are offered on the Thomas Jefferson University campus in Philadelphia. Most classes are offered during the evenings, although some required classes and activities may be offered during the day. hours are during the day, usually on weekdays. Clinical experiences take place under the guidance of experienced advanced practice nurses, school nurses, clinical nurse leaders, physicians, or other advanced nursing practitioners as appropriate to the area of specialization and to the program. Required practicum hours for each course are listed in the course descriptions. Nursing 634, 635, 636, 637, 638, and 690 require up to two days per week for daytime clinical hours. NURS 633 requires one day per week for daytime clinical hours. Clinical experiences take place under the guidance of experienced advanced practice nurse or physician preceptors. Each NP student also completes an additional 35 hours of health assessment clinical. Practicum hours for each specialty take place in various settings as appropriate to the specialty and population.